Research can take the form of finding family in Ireland, finding the old homestead, or finding the family burial place. I have experience with all of these, and more. Many people know that they have cousins in a particular area, but the families have lost contact. Surnames change on marriage, and people move away. It’s often not possible to find second and third cousins by surname alone. 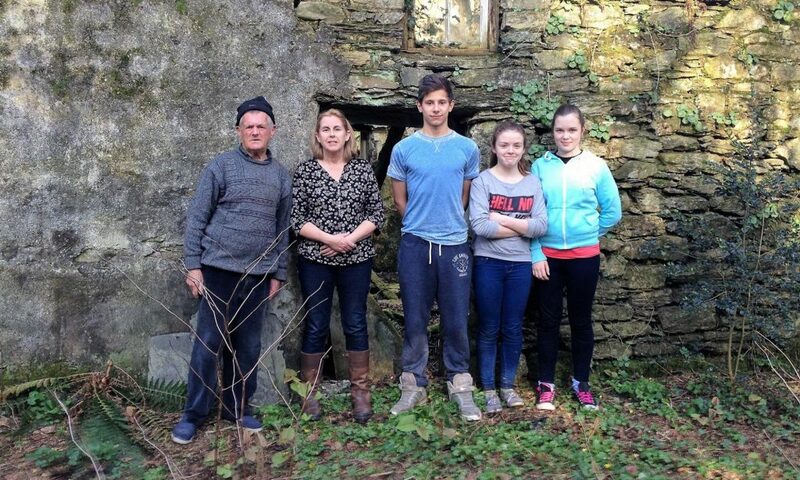 YourIrishFamilyTree has helped several families to reunite with their cousins in Ireland. 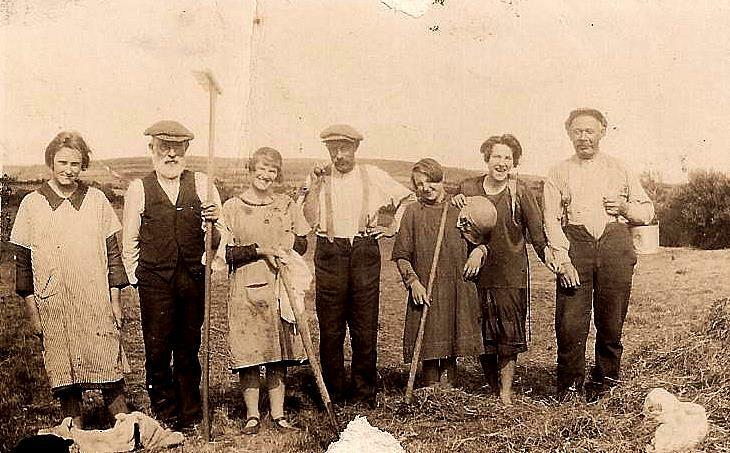 If you have a firm townland identification (or parish, if the surname is uncommon), a good map and a friendly attitude, it’s nearly always possible to find present-day family. Even if they have moved, someone living locally will know how to find them. Re-introducing cousins is one of the most satisfying aspects of genealogy. 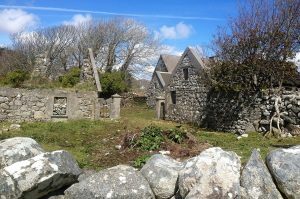 When you travel through the countryside in Ireland, you will notice old houses everywhere you look. When a farming family built a new dwelling, it was rare for the old house to be knocked; instead, it became an outhouse, or shed. Sometimes these outhouses were used to house animals (as a child, I milked cows in the house where my own father was born). Sometimes they stored farm machinery, as, in the 1930s and 1940s, people acquired ploughs and tractors. Sometimes they were called “car houses”, storing the carriages and carts which were the ubiquitous means of transport, for people, and for conveying produce to markets. This change of use meant that these old houses survive to the present day. 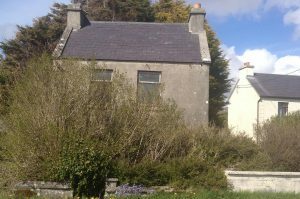 It is very common to find your Irish cousins living in a new house right beside the old house where generations before them were born. As the 1911 census not only recorded people but also the type and size of house, it is perfectly possible to identify these houses, and to very accurately describe the lives of the occupants. ….or hiding shyly, waiting to be re-discovered…. 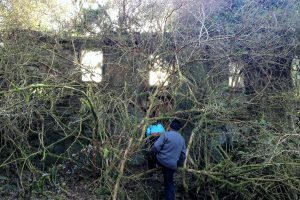 ….or almost reclaimed by nature…. ….or on its way to becoming a walled garden…. 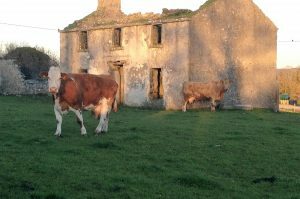 Finding the old homestead is of huge emotional and sentimental value You might find you get so attached to it that you end up buying it….it has happened more than once! It’s good to see something literally written in stone, and cemeteries are full of information for the genealogist. 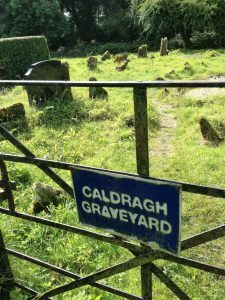 It’s not always possible to find where your ancestors are buried; often, people were too poor to afford headstones, and it was enough for them to know where their ancestors were buried. 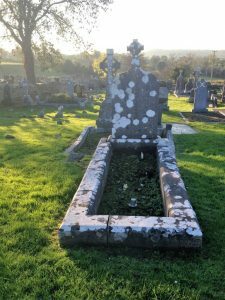 In one family I researched, the earliest tombstone on the paternal side from a mere sixty years old, but local people knew with certainty that the family had been using that burial plot for generations. 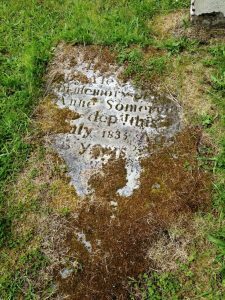 On the maternal side, there was a luckier discovery: a headstone with a date of 1824. 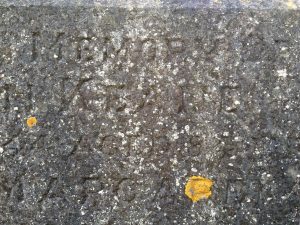 There was a tradition of stone carving in the family, and so, we can presume, the 1824 headstone was carved by a family member at no cost. 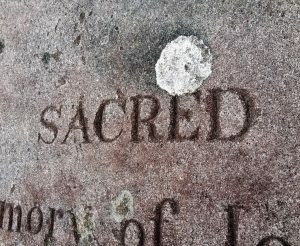 Many older cemeteries have a “famine plot”, where dozens of ordinary, uncarved stones mark the graves of people whose names were never recorded, and who, in those awful times, were lucky to have been buried at all, by families and neighbours who were on the verge of starvation themselves. 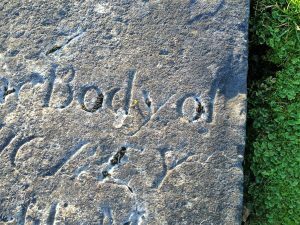 The better-off families often have gravestones with inscriptions stretching back two centuries, and most family graves record burials since about 1900. If they seem unreadable, there are several techniques to improve legibility. 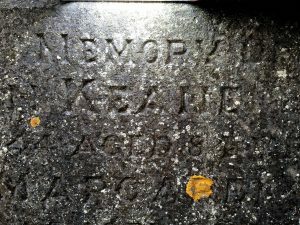 Even the most time-battered engravings can be read, using a variety of techniques. These photos show what can be done just by using a bright torch, held at an angle. 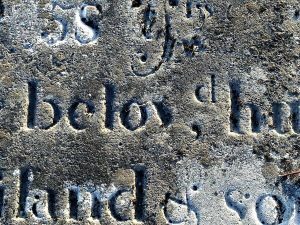 It is the most satisfying element to the work of a genealogist when cousins can be introduced to each other, but sometimes a name of a gravestone has to take the place of a warm handshake. To find that small plot of land in a well-kept cemetery can be important too.